Jacqueline M. “Jackie” Keyes, age 81, of Sheboygan, passed away early Wednesday morning (November 21, 2018) at Sheboygan Health Services where she had been a resident for the past 2 years. She was born in Sheboygan on February 20, 1937, daughter of the late Harold and Olga (Weber) Harder. She was also raised by her Step-father: Edwin Wilke. Jackie attended Trinity Lutheran Grade School in Sheboygan and Sheboygan Central High School. On October 20, 1956, she married Gilbert Keyes at St. Peter Claver Catholic Church in Sheboygan. The couple resided in the Town of Lyndon and in Plymouth for 50 years, and in Sheboygan for the past 4 years. 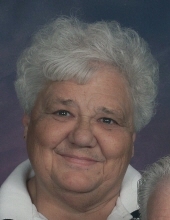 Jackie worked at Riverview Middle School in the Hot Lunch program and Library for many years. She also worked at Q-Mart in Plymouth. Jackie enjoyed cooking, baking, knitting, crocheting, and visiting with people at the Bar-B-Que. She fought a courageous battle with health problems, and will be greatly missed by her family and friends. Survivors include: Her husband of 64 years: Gib of Sheboygan; Two children: Bob (Donna) Keyes of Plymouth and Susan Anderson of Sheboygan; Five grandchildren: Ethan Keyes of Plymouth, Cheyenne Keyes of Plymouth, Melisa (Chris) Engebose of Luxemburg, WI, Christopher (Shayla) Anderson of New Holstein, and Amanda (Nick) Western of Sheboygan; Six great-grandchildren: Isaac, Jacob, Jacquelyn, Andrew, Mason, and Connor; and Two brothers-in-law: Thomas (Kathleen) Keyes of Sheboygan Falls and Wayne (Kay) Keyes of Plymouth. Jackie was preceded in death by her parents, and two sisters: Kathryn Reif and Ardith (Paul) Fleischmann. A Mass of Christian Burial will be held on Saturday (November 24, 2018) at 12 Noon at St. John the Baptist Catholic Church in Plymouth. Father Richard Fleischmann will officiate, and burial will be in the Parish Cemetery. Visitation will take place at CHURCH on Saturday (Nov. 24) from 10:00 A.M. until the time of Mass at 12 Noon. In lieu of flowers, a memorial fund is being established in Jackie’s name. The family would like to send special thanks to the entire staff at the Sheboygan Health Services Center for the wonderful care and compassion given to Jackie. To send flowers or a remembrance gift to the family of Jacqueline M. Keyes, please visit our Tribute Store. "Email Address" would like to share the life celebration of Jacqueline M. Keyes. Click on the "link" to go to share a favorite memory or leave a condolence message for the family.